In this week’s profile, you’ll learn a little about Lagotto, a breed of dog that comes from the Romagna sub-region of Italy. Kathy Haglof is the owner of Lagotto Lady Kennels, located in Lindstrom, Minnesota, which is about 35 miles Northeast of the Twin Cities. She was gracious enough to respond to our questions via email to discuss the Lagotto breed as well as her business. Ciao Pittsburgh: Tell us a little more about where you are from and about your business. I have always been involved with animals since I can remember, always lived on farms, where I was able to take in strays (cats and dogs and other) and care for them. For 15 years I raised and trained appendix quarter horses/paints and enjoyed showing them mostly English and western classes. But I must say the most challenging and fun equine event for me was later found in Team Roping. Today, I enjoy non-competitive trail riding in many of the beautiful State Parks in the area — it’s a great way to relax and rejuvenate my spirit. Next to the horse pasture is phase one of Lagotto Lady Kennels — a beautiful setting on top of a hill overlooking woods, lakes and farm land. It’s very important to me having a roomy, safe and comfortable place for my beloved Lagotti. My farm has facilities both connected to my home in conjunction to half my horse barn which has been converted into a comfortable and cozy dog facility, we also have a nice training shop/facility set up for training our detection dogs. All of our dogs spend quality time with us in the home — as they are an extension of our family. In the summer, our dogs enjoy swimming in the many lakes that surround us. About four years ago, I acquired my first Lagotto, today I have six, some coming from Italy, Sweden, Hungry and British Columbia. My goal is to have fun, enjoy the journey, never quit learning, and to improve the breed, litter by litter. Ciao Pittsburgh: How did you get started breeding dogs? What do you find to be the most rewarding aspect of breeding Lagotti? Kathy: About four years ago, we were looking to add a detection dog to our established Home Moisture Testing Company (Certified Moisture Testing). I was doing a search on the Internet for the perfect dog… A dog with an unbeatable sense of smell… this is where I discovered the Lagotto. After much research, I purchased my first Lagotto with the intention of future breeding. I attended a detection training course by Alpha K-9 owned by Rand Hare who has an unsurpassed and proven track record in teaching police and military trainers and handlers. LK Augusta passed with flying colors — detection work is her absolute favorite thing to do. The most rewarding, yet heartbreaking, aspect of breeding is seeing your pups go off to new homes — you grow so attached to each and every pup it’s sad to see them go. On the flip side, by the time they are 8-9 weeks old, it’s nearly impossible to give the individual attention they need. As a breeder, it is my responsibility to protect my puppies as well as the breed in general. For this reason I carefully screen puppy buyers to be certain that my puppies go to caring homes that will give them all the love, attention and training they need to develop into wonderful forever companions. In the end, the most rewarding part is to hear back from these puppy buyers on the pups progress, and how much they love and joy they bring to their new homes. Ciao Pittsburgh: Tell our readers why this particular breed would make a good pet. Kathy: Lagottos are affectionate, undemanding and devoted dogs. They make an excellent companion and enjoy being with their owners as they are very loyal and loving. They are a working dog, are easy to train and eager to please. Being intelligent it is important for their minds to be occupied and they do well at agility or obedience training. Whether working or playing, they have the ability to concentrate at the task at hand and are not easily distracted by other scents or animals. Many people who are allergic to dogs find the Lagotto (and a few other breeds) are tolerated better than dogs than shed. Ciao Pittsburgh: What makes them an Italian breed? 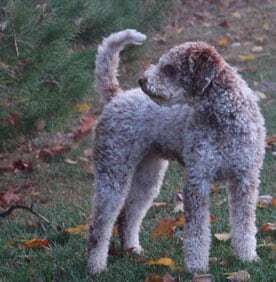 Kathy: The name Lagotto derives from the breed’s original “career” as a water dog. In the local dialect of the Romagna “Càn Lagòt” is synonymous with “water dog” or “wetland hunting dog with crimped, curly coat.” A sharp aptitude for searching, a steep learning curve and an unbeatable sense of smell, would, in time, make the Lagotto a very efficient truffle-finder. Over the decades, land reclamation steadily shrunk the immense wetlands of Comacchio and other parts of the Romagna. The “Vallaroli“ practically disappeared and the Lagotto gradually lost its function as a water dog and specialized more and more in truffle finding. The transition took place between 1840 and 1890. Between the two world wars, almost all truffle dogs in the Romagna and surrounding areas were Lagotti. Even as far back as 1920 the Lagotto was well known in the valleys of the Romagnolo Apennines, in the Valle del Senio, Valle del Lamone and especially in the Valle di Santerno. Back then no one was interested in the Lagotto as a pure breed – the existing breeds were considered to be more than sufficient and the cross-breeds were often even more appreciated on account of their robustness, character and resistance to disease. Truffle hunters have always bred their dogs on an entirely empirical basis (outside of any genetic rules), taking into account only the immediate, practical outcome – a brilliant truffling dog, whether Lagotto or not. The continued in-breeding of the Lagotto by the Vallaroli of Comacchio, resulted in an ‘exhausted’ Lagotto in the Romagna valley. At the same time, repeated and ungrounded crosses with other breeds introduced much foreign blood into the breed. However, credit must be given where credit is due. The truffle hunters of that period did not let our Lagotto fall by the wayside. It has survived to this day – almost by a miracle – in a near-perfect phenotypic and genotypic form. Towards the mid 1970s a group of Romagna-based dog lovers decided to save the breed, which risked extinction as a result of the incompetence, ignorance and negligence of owners. The group was led by the gentlemanly Quintino Toschi, President of the local dog society and the E.N.C.I. breeder and judge Prof. Francesco Ballotta (who still remembered the Lagotti of his youth perfectly). They were supported by the dog expert, judge and world-famous breeder Dr. Antonio Morsiani and Lodovico Babini, a Romagna-born dog lover with extensive experience. They were to set a genetic reconstruction program in motion that would save the Lagotto from the one-way path to extinction. The reunification of the two parallel histories of the Lagotto – the one that took place in the wetlands and the one that took place on the Apennine hills – were to lay the basis for the renewed purity of the breed. With the founding of the Club Italiano Lagotto (C.I.L. – Italian Lagotto Club) in Imola in 1988, which now has 300 members all over the world, a firm foundation for of- ficial acknowledgement of the breed by E.N.C.I. and F.C.I. was created. Official recognition by E.N.C.I., with approval of the morphological Standard drawn up by Dr. Antonio Morsiani (following years of biometric measurements on hundreds of subjects), was achieved in 1992. In 1995, thanks to the constant dedication of the Club and its technical committees, provisional international recognition by F.C.I. was won. In the meantime the breed has enjoyed European and worldwide success and the number of puppies registered at the various F.C.I., British and American Kennel Clubs is constantly growing. For example, in Italy, 545 pups were registered in 1994 and nearly 900 in 2002 – a near-doubling of births in just 9 years. In countries such as Switzerland, Belgium, Germany, France, Finland, Norway, Sweden, Great Britain, USA and Australia the number of registered puppies has increased tenfold – and in some cases a hundredfold. In order to safeguard and coordinate proper morpho-functional selection at the international level, 1997 saw the establishment of U.M.LAG (World Union of Lagotto Clubs – Unione Mondiale dei Club Lagotto Romagnolo), the president of which is Dr. Giovanni Morsiani. Lagotto Clubs in the above-mentioned countries are members of this association and there is a constant stream of affiliation applications from new clubs all over the world. The main goal of U.M.LAG. is to ensure the pure breeding of the Lagotto outside the borders of its homeland. The various national clubs should be informed about changes in the breed standard and working standard and about any breed specific diseases or other problems. This information exchange takes place mainly at a technical seminar which is organized during the yearly C.I.L. RADUNO. Ever more often, national Lagotto clubs take the initiative to communicate breed specific information over their borders. Special mention deserves to go to the world-wide Lagotto data bank, created and maintained by Laura Tanos of the Hungarian Lagotto Club (www.lagotto.hu). On July 6, 2005, the Lagotto Romagnolo was officially recognized by the F.C.I. as the thirteenth breed of Italian origin. Ciao Pittsburgh: What separates your business from other similar breeders? Kathy: I’m not so sure I’m that so different than other Lagotto Breeders (there are so few, I don’t know them all), I would like to think that we all strive to improve the breed, litter by litter. What I can say is my original intent for this breed was primarily for detection work. I own a Home Moisture Testing Business (Certified Moisture Testing) where we actually use our dogs to detect moisture in homes, (such as wet building materials). Not being the only tool we use, but particularly helpful for those homes going into litigation where it is crucial to find as much as possible, (being the dog sees through the nose), they catch areas we may have not seen. Our dogs are trained to identify the smells of wet wood, insulation, dry rot and other building materials, not mold. Dogs have been used successfully to locate mold in homes, but mold is the by-product of moisture. Identifying the source where moisture issues are occurring is our dogs’ specialty. For any scent detection dog to be accurate, extensive training of the dog and handler must always be conducted. Our dogs and handlers are certified for scent detection through Alpha K-9 Training in Jackson Mississippi. Alpha K-9 specializes in training detection dogs for Police, Military, SWAT and FBI teams. Alpha K-9 is impressed with the Lagotto’s skills in scent detection and our unique use for the dog. Ciao Pittsburgh: What have been the keys to your business’ success? Kathy: Start with great dogs… with super temperaments and sound health. All of our breeding pairs are evaluated for compatibility in type, temperament and potential genetic health problems. All are x-rayed for hipdysplasia and other potential joint problems which are a major concern with this breed. Through careful evaluation,we disqualify any animals from consideration for breeding that we feel would not produce the highest probability of excellent, healthy puppies. Having a background in nutrition and natural health care is a must as well as feeding the highest quality foods and following the most conscientious practices of healthcare protocol possible. No one wants healthy puppies more than we do. The second most important key to success is having a great/knowledgeable Mentor. No matter what business you are in, I think it’s safe to say, we all learn from a mentor, weather you are looking to be a sales person, computer programmer, dog training or rocket scientist… having this relationship to seek advise, get encouragement and help me along the way is something I’m so very thankful for. Love what you do, strive to do better with each litter and be thankful for the people that have helped you along the way and never, ever quit learning. Ciao Pittsburgh: In building your business, what have been your most important learning experiences? Kathy: You never, ever quit learning. Ever. My hats off to all the breeders that strive to produce quality dogs… It’s much hard work, and heartbreaking at times. Being a breeder, and to do it to the best of your ability, is extremely time consuming, expensive and keeps you at home most the time. You must have a passion for it, or your doing it for all the wrong reasons..